Sir Alex Ferguson has admitted that the first thing Manchester United must organise for David Moyes is a new watch! The sight of Ferguson jabbing his wrist-watch to indicate he knows how much time should be added on has become a familiar sight for refs over the years. 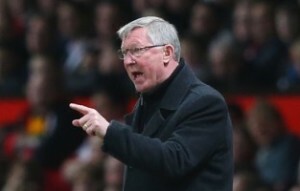 And his team have scored countless goals in ‘Fergie time’. Asked if he would be giving Moyes his watch as a welcome present, Fergie told MUTV: “He’ll get one, don’t worry. We’ve got good sponsors. Will it have Fergie time? I don’t know about that. “Biting your nails is part of it at United for our fans. Memories will always take us to those last-minute goals. My son was trying to count them — there must be about 30 that have really meant something.